Is New Russia a Reliable Partner? As Ukraine and NATO accused Russia of sending troops to launch a new offensive in eastern Ukraine, experts had warned of a showdown between Russian President Vladimir Putin and the Western leaders at the G20 summit held in Australia. Before reaching Brisbane, Putin had denied sending tanks into Ukraine and said that he would not bring up the issue of the G20 meeting ‘it'll make no sense’. He however had a tough time. But to show his muscles, Vladimir Putin had come to Australia accompanied by 4 warships, which he stationed off the country’s northeastern coast. The world media agreed that the West ‘lined up to browbeat him over Ukraine’; as a result, Putin left before the farewell lunch. All is not well between India and Russia too. Take the project of a fifth generation fighter aircraft (FGFA). 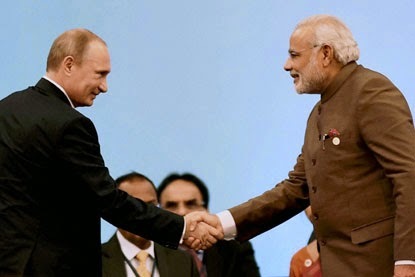 New Delhi is more and more concerned about the slow progress of the joint venture between India and Russia. The worst is that despite being equal partners in the FGFA project, Moscow is not keen to share technical details about its next generation stealth fighter. 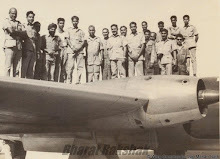 In 2010, officials of Hindustan Aeronautics Ldt. (HAL) and Russia’s Sukhoi Design Bureau had signed a preliminary agreement to jointly design and produce a FGFA to be later used by both countries. Delhi and Moscow are said to have invested US $ 295 million for the preliminary designs. Unfortunately, differences on the work share have cropped up between HAL and Sukhoi with the Indian side rightly insisting on parity. Ultimately the project is supposed to cost over $30 billion for about 400 aircraft, out of which India requires a total of 144. But when the IAF asked a twin-seat variant, Moscow demanded an additional $1 billion, which was refused by Delhi. The precursor for the FGFA is the PAK-FA (an acronym for Perspektivnyi Aviatsionnyi Kompleks Frontovoi Aviatsy or Prospective Aircraft Complex of Frontline Aviation); also referred to as the T-50 by Sukhoi, the aircraft first flew in January 2010. Moscow says that five prototypes are currently being tested. In November, Russian Deputy Premier Dmitry Rogozin visited New Delhi (ahead of Vladimir Putin’s arrival in India in December) to discuss issues related to the FGFA. Some sources said that the differences have now been ironed out and that a deal is expected to be inked in December during Mr. Putin’s visit. It is highly improbable. Another irritant has recently emerged in the bilateral relations between India and Russia; it will also have to be sorted out before Putin’s arrival: a ‘Chinese’ Brahmos appeared at the Zhuhai Airshow 2014 in China. The new CX-1 supersonic anti-ship cruise missile (ASCM) developed by China Aerospace Science and Technology Corporation (CASC) strangely resembles the Russian-Indian BrahMos cruise missile. Well, the Government will have to look into the issue in greater detail and check if the Russians are as reliable partners as they have been in the past. A small mercy, Air Chief Marshal Arup Raha announced that the Indian Air Force (IAF) was able to find the technical defects in the Sukhoi-30 (SU-30) aircraft which resulted in a crash of one aircraft and the grounding of the fleet. Raha said: “The court of inquiry has not yet finalised the final findings. But preliminary findings we know and we know we will be able to tackle it. I don't want to tell you exactly the reason, but we know the reason." On October 14, a Su-30 had crashed when both seats of the aircraft were ejected; fortunately both pilots survived. At that time, a MoD released a statement: "One Su-30 fighter of the IAF was involved in an accident … in which both ejection seats had fired whilst the aircraft was coming in to land. A Court of Inquiry (CoI) had immediately been constituted to investigate the cause of accident. Meanwhile, as is the procedure in such cases, the flying of the Su-30 fleet has been temporarily suspended [while] certain specific checks are being conducted on the aircraft." 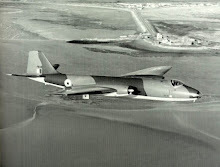 The CoI has not been able to give its conclusions so far, as the Russians insist that it was a ‘pilot error’. Anyway, according to Raha, the IAF will start flying the aircraft in a few days. Ambassador Kadakin explained to some Indian journalists: "We (Russia) are still very surprised that Rafale is being bought, because if the Rafale is intended to oppose Pakistani or Chinese planes, then the Sukhoi which the Chinese produce, or mobilizes, but which is only 50 percent of the Sukhoi which you (India) produce, then even for the Chinese Sukhoi, these Rafales will be like mosquitoes on an August night. They will be shot down like mosquitoes. That's why I don't understand why..."
Francois Richier, the French envoy to India wisely answered that he would not like to make any comments uttered by a ‘grumpy competitor’, adding “The negotiations [for the Rafales] are progressing well." He quoted statements made by Indian defence officials in the recent past about the progress and the recent visit to Delhi of Chairman of French Dassault Aviation:"It is a signal that it is moving in the right direction." Whether the story is true or not, the times have changed, though it is apparent that Vladimir Putin is still suffering from the Soviet Union ‘nostalgia’. Let us hope that this will not disrupt India’s old partnership with Russia, though Delhi should remain firm with Moscow and refuse to take any bullying. A Rainbow Body for the Party? One evening of 1954 in Beijing, Mao Zedong had come to visit the Dalai Lama in the guest-house where the latter was staying. Suddenly, the Great Helmsman turned to the young Lama and said “Religion is Poison”. The 19-year old Tibetan leader was stunned: religion for him and his countrymen was everything; for centuries, Tibet lived by the Buddha Dharma, for the Buddha Dharma. Sixty later, the Party line has not changed, but there is a difference, the Chinese ‘masses’ are more and more attracted to the Buddha’s teachings. But it is not that simple as today China is land of contradictions. Zhu affirmed in the strongest terms: “Communist Party members must not follow any religion; it is an ‘unshakeable’ principle of the party …Communist Party members cannot follow any religion – this is the important ideological and organisational principle which has been upheld since the founding of the party”. A few weeks earlier the all-powerful Central Commission for Discipline Inspection (CCDI) criticized some party cadres in Tibet for secretly taking part in religious activities. Chen Quanguo, Tibet's Party Secretary told the Standing Committee of the Regional Party in Lhasa: "One should not believe in the 14th Dalai group’s fantasies (illusions), or follow the Dalai group; one should beware infiltration and sabotage activities in which are involved separatist party cadres." One of the contradictions: while warning the cadres not be trapped in the 'Dalai Lama's fantasies', the Party is promoting Buddhism on a large scale in Eastern Tibet (Kham). An article in China Tibet Online, a affiliate of Xinhua, praises ‘Larung Gar Five Sciences Buddhist Academy, a Buddhist University in Eastern Tibet, pointing out that a previous incarnation of Jigme Phuntsok Rinpoche, Larung Gar’s founder was a teacher of His Holiness (sic) the Thirteenth Dalai Lama (of course, it is mentioned that the same Khenpo Phuntsok once visited Dharamsala to share teachings with the present Dalai Lama). Yes, you read correctly, the Communist media speaks of ‘reincarnation’. Can you believe that the Communist publication speaks of the mystic ‘rainbow body’, a siddhi which allows a high-realized master to dissolve the material components of his body into a rainbow at the time of his death, thereby leaving no mortal remains? So, is Dharma poison or nectar? 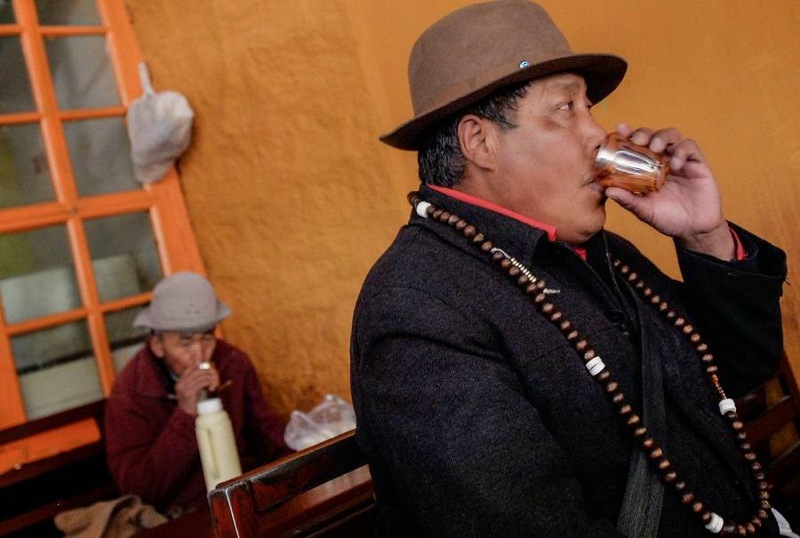 While some in the Party reject religion, others are fast becoming experts in Tibetan Buddhism. Unfortunately, Beijing is not enamoured with the Dalai Lama as yet. In August, Beijing was delighted when the Tibetan religious leader’s visit to Mongolia was canceled (of course, this was done under Beijing’s own pressure). How could the Dalai Lama visit Ulan Bator the same month than the new Emperor? Xi Jinping had to pay a two-day state visit on August 20 and 21 to Ulan Bator. Suppose that the Dalai Lama had got a better reception than Xi Jinping, it would have not looked nice for the strong man in Beijing. Isn’t it? And Mongolia, being China's largest trading partner, Ulan Bator had no choice but to bow to Beijing's will and cancel the visit. Of course, very few have heard of these ‘rinpoches’ before, but it is another issue; the point is that though Xi Jinping’s regime pretends to be atheist, it is not when politically convenient. In the meantime, some Chinese cadres have started studying Tibetan Buddhism. Incredible China! On October 20, China Tibet Online announced that a seminar on Tibetan Buddhism was held at the China Tibetology Research Center in Beijing. The theme of the in-depth discussion was 'Tibetan Buddhism and Equality'. It was a two-day seminar sponsored by the China Tibetology Research Center and the High-level Tibetan Buddhism College of China. In other words, senior Party cadres were learning Buddhism ...without, of course, ever referring to the Dalai Lama. At the same time, China remains extremely intolerant. For example, Gedhun Choekyi Nyima, born on April 25, 1989 and recognized as the 11th Panchen Lama by the Dalai Lama, is still under house arrest in China; the authorities in Beijing have systematically refused to let the world know about his whereabouts. He has not been seen in public since May 17 1995, nearly twenty years ago. This proves that Communist China is not truly Buddhist yet. An even more amazing fact, the Party now says that Confucius taught ‘religion’ in Tibet. According to the Chinese official media, the wise man became known in Tibet as a human with 'divine power', under the name of Kongtse Trulgyi Gyalpo. According to Beijing, Confucius was a master of the Bon; the pre-Buddhist faith in Tibet: “In order to promote the Bon religion, Confucius traveled to many places far away from home, and learned from masters until he finally built a monastery of the Bon religion. However, he wasn’t able to protect the monastery on his own, so he invited Shenrab Miwoche [the founder of the Bon faith] to help out and later regarded Miwoche as his master," says the Communist website. Great, but why did Mao say that 'Religion is Poison'? Let us hope the Party will soon take a Rainbow Body in the firmament of the Middle Kingdom. Is the Zangmu dam 'clean'? 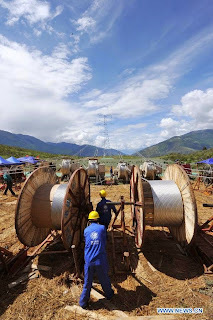 This is in continuation to my previous post on the new electricity grid recently launched between Chamdo and Sichuan. I raised the question: once the dams on the Brahmaputra are complete, will this (grid) investment be used to send electricity from Tibet to Sichuan or vice-versa. 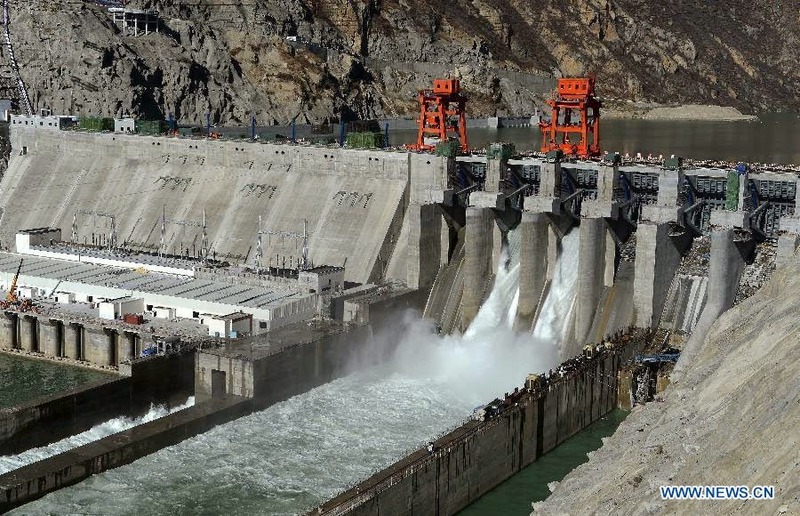 We shall know soon, as the first run-of-river hydropower plant at Zangmu on the Yarlung Tsangpo, (which becomes the Siang and later on the Brahmaputra), is now operational. Xinhua announced yesterday: "Tibet's largest hydropower station became partly operational, harnessing the rich water resources of the Yarlung Zangbo [Tsangpo] River to develop the electricity-strapped region." 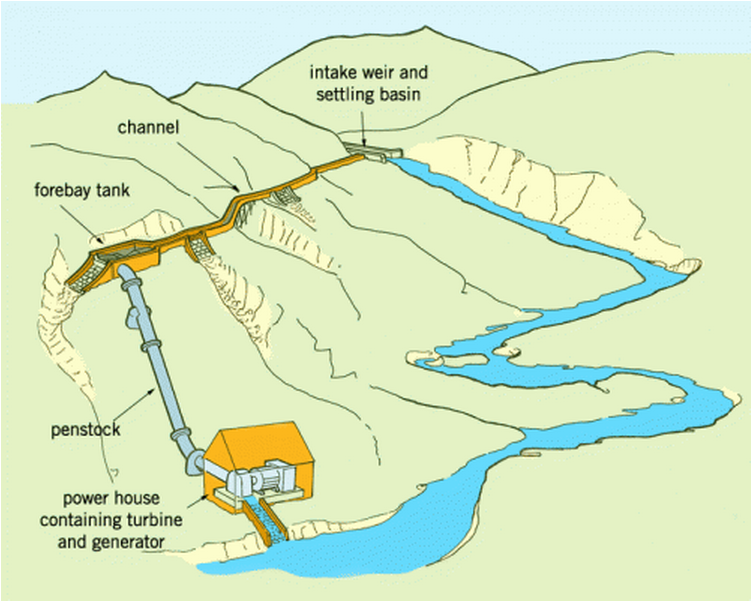 It is the first generating unit of the Zangmu Hydropower Station (costing 1.5 billion U.S. dollars). The project is located at 3,300 meters above sea level. 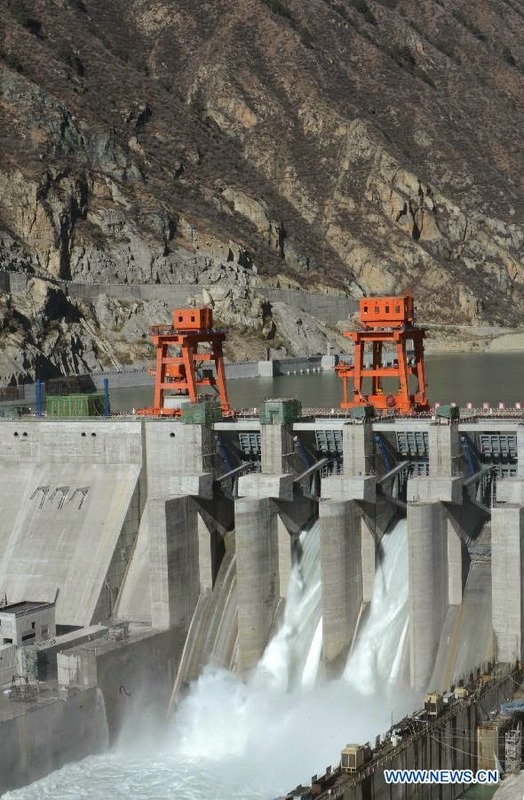 Xinhua says that "five other generating units are due for completion no later than next year", adding "the huge project, which straddles the middle reaches of the roaring Yarlung Tsangpo River, will have a total installed capacity of 510,000 kilowatts [510 Mws] upon completion. It is designed to generate 2.5 billion kilowatt hours of electricity annually." 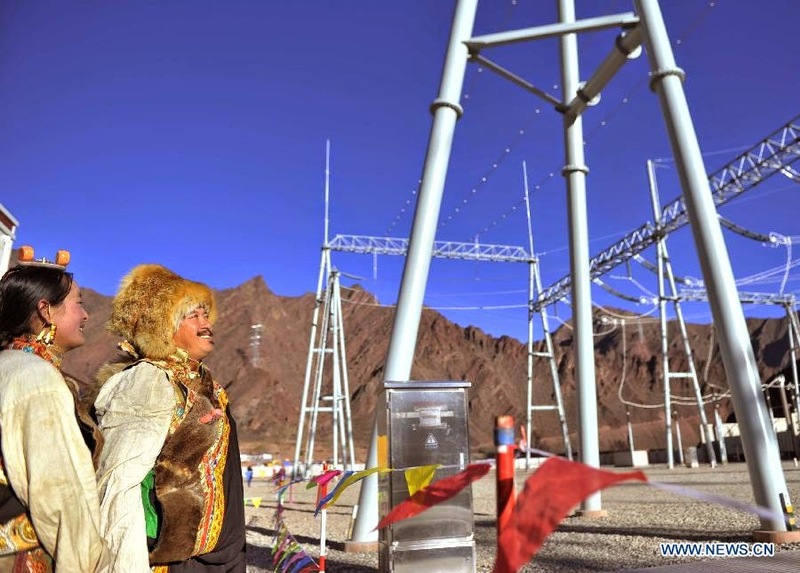 According to Chinese official statistics, Tibet's per capita electricity consumption in 2013 was slightly over 1,000 kilowatt hours, less than one third of the national average. Will the entire production of electricity of the 5 'officially' planned dams on the Tsangpo be used on the Tibetan plateau or will it be sent to the mainland? 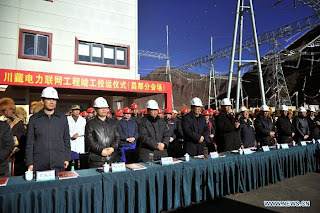 The official news agency is obviously mum on the subject, though Liu Xiaoming, an official of the State Grid's Tibet Electric Power Co affirms: "The hydropower station will solve Tibet's power shortage, especially in the winter." 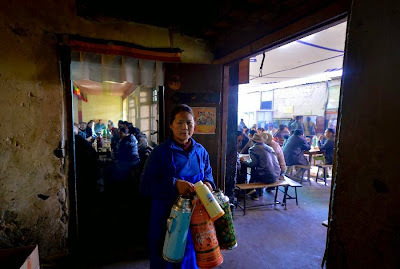 Tibet's Development and Reform Commission (local Planning Commission) asserts that "the region's installed power generating capacity was 1.48 million kilowatts.Tibet has annual water resources totaling 448.2 billion cubic meters, with potential water power resources reaching 201.36 million kilowatts. It holds nearly 30 percent of the nation's total water power resources." It is a boon or a curse for the Roof of the World? Though Lobsang Gyaltsen, the head of the Tibetan government declared: "The region has strived to protect the environment throughout construction. The hydroplant is a good example of clean energy development," run-of-river plants are not today considered 'clean' anymore. There is no doubt that the life of the river between the 'intake' of the diversion and the power station downstream will be badly affected. One has recently seen the negative consequences of the 'run-of-river' plants in Uttarakhand (see my post, Dam is money, dam is destruction too). between the intake and the power house? The Xinhua communique affirms: "A total of 320 million yuan has been invested in the Zangmu hydroplant project to build environmental friendly facilities such as sewage treatment plants, garbage recycling stations and fish protection stations." Will China let environmentalists visit the site and study the state of the river before the diversion and after the power station? According to Bo Lunzhang, an official of the regional environmental protection bureau. "The Yarlung Tsangpo River requires much higher protection standard than any other rivers in China, and the experience of Zangmu station may be learnt by other hydropower projects in Tibet." China may learn from the Zangmu experience, but run-of-river plants elsewhere in India and the world have been very damaging for the environment (the aquatic life of the river for example). Will the waters entering Upper Siang district of Arunachal Pradesh be different now? India should carefully and scientifically monitor, not only the flow of the Siang, but also the quality of the water. Article 12 of the 'Implementation Plan' signed in June 2014 between Indian and China for providing 'Hydrological Information of the Yarlung Zangbu/ Brahmaputra River in Flood Season by China to India' says: "In order to ensure normal provision of hydrological information, if necessary, after mutual consultation through diplomatic channel, the parties may dispatch hydrological experts to each other’s country to conduct study tour according to the principle of reciprocity." Why can't Delhi ask Beijing's permission to send a team of hydrological experts to visit the dam and get some clarity on what is going on? 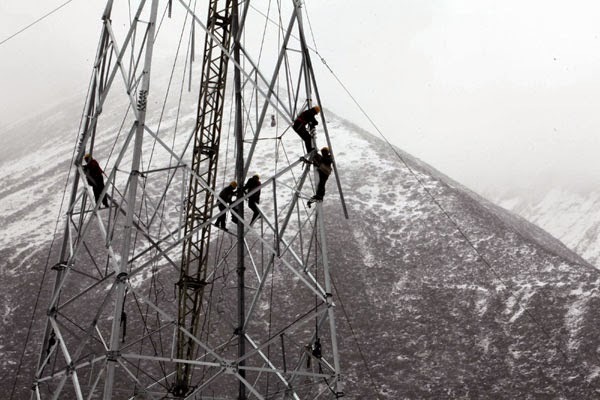 Xinhua has just announced that the Tibet-Sichuan grid is now functional. 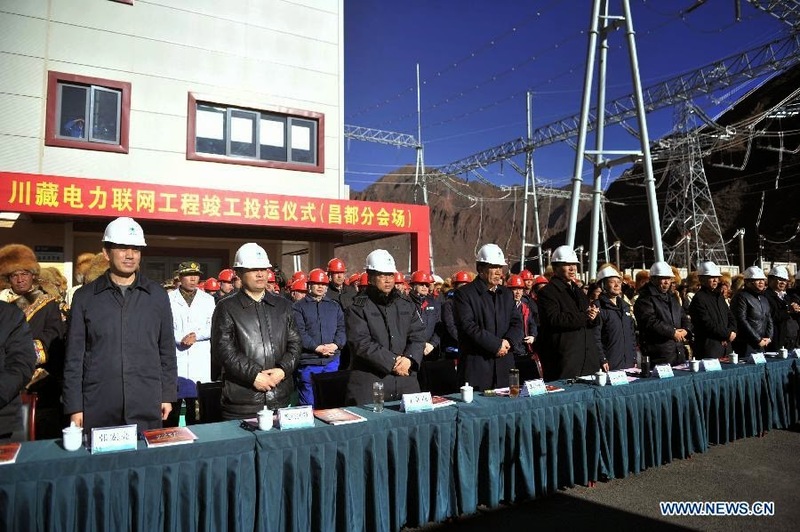 The launching ceremony was chaired by Yu Zhengsheng, Chairman of the Chinese People's Political Consultative Conference (CPPCC), who declared operational the power lines linking the Tibet Autonomous Region (TAR) to Sichuan Province. The function was held in Beijing. 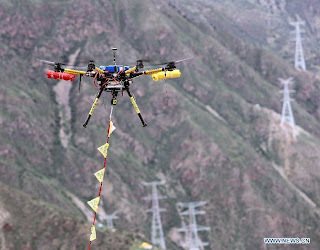 Xinhua reported that the opening of the 1.08 billion U.S. dollar project linking Chamdo in the TAR and the Tibetan Autonomous Prefecture of Garze in Sichuan Province, aims at "putting an end to the electricity shortages of the 500,000 residents of the Chamdo region and ease power strain in Tibet as a whole". 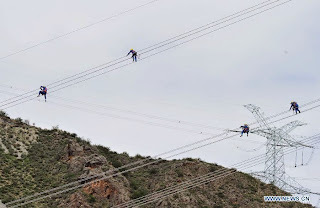 The news agency further explained: "The complex interconnection circuits stretch 1,521 kilometers across the plateau at an average altitude of 3,850 meters and its construction involved more than 20,000 staff over eight months, according to the State Grid Corporation of China." 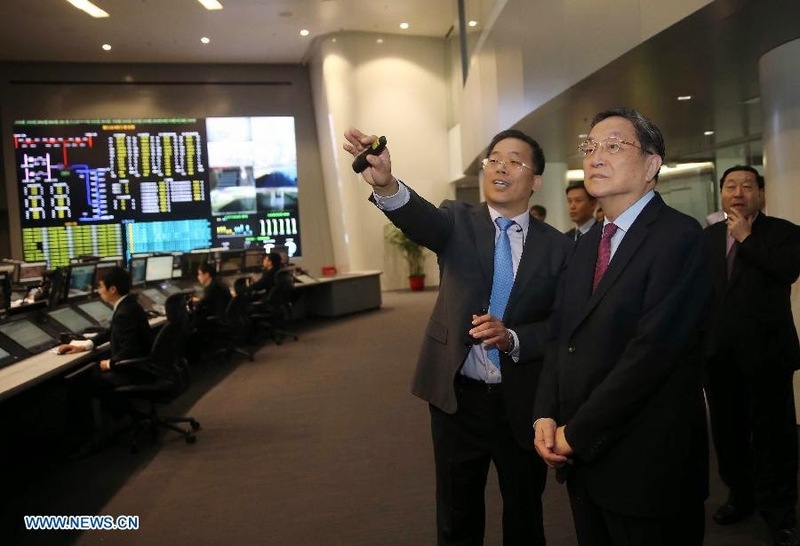 Before the official launch, Yu inspected the power 'dispatching center' at the State Grid's headquarters where he met workers and engineers involved in a grid construction. He was accompanied by Chen Quanglo, the TAR's Party Secretary. The billion-yuan question is: will this investment still be used to send electricity from Tibet to Sichuan or vice-versa, once the dams on the Brahmaputra are complete. 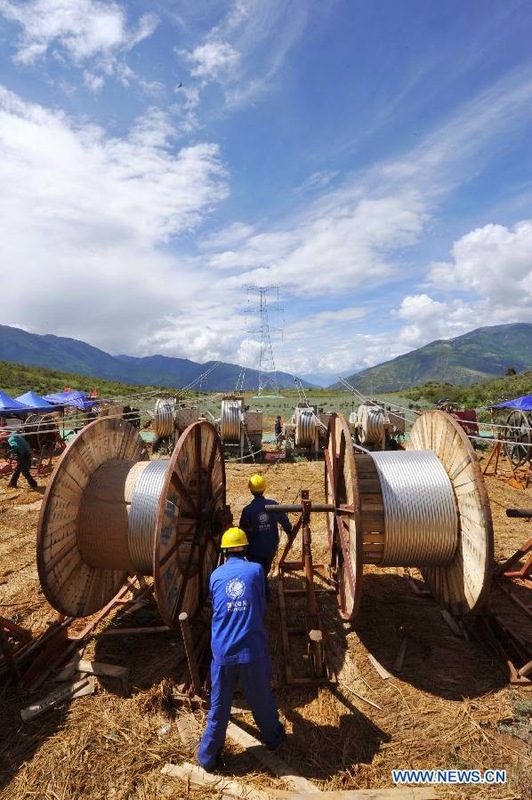 The West - East Electricity Transfer Project, initiated in the Tenth Five-Year Plan (2000-2005), was designed to bring investment and development to China’s lagging west while satisfying the growing electricity needs of the country’s eastern provinces. The project’s first phase has been and is continuing to expand the western provinces’ electricity-generating capacity, primarily through the construction of new coal bases and hydroelectric dams.The project’s second, ongoing component is the construction of three electricity-transmission corridors, which are essentially three vast networks of electrical transmission lines that connect newly built generation capacity in the North, Central and South to China’s electricity-hungry coast (see arrows on map). Each of the corridors is expected to exceed 40 gigawatts (GW) in capacity by 2020—a combined capacity equivalent to 60 Hoover Dams. 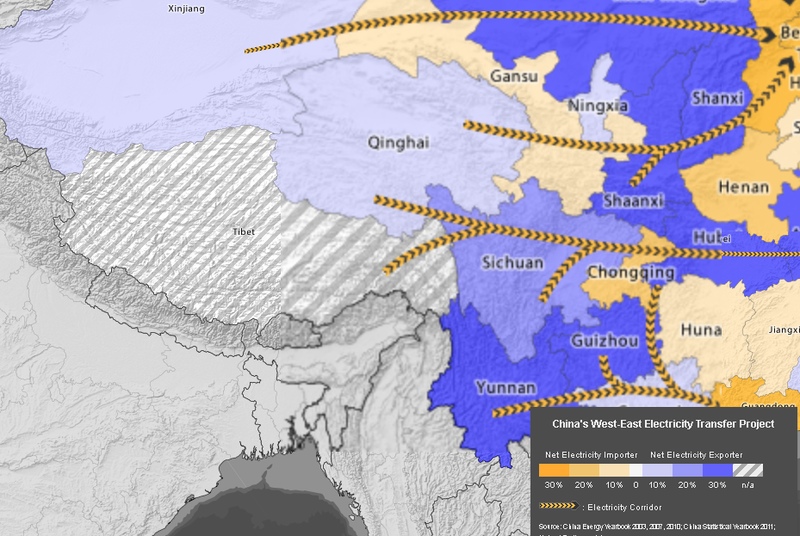 The seven recipient provinces — Beijing, Tianjin, Hebei, Shanghai, Zhejiang, Jiangsu, and Guangdong — together consume nearly 40 percent of China’s electricity. A few pictures of the grid and the function. My article Nehru’s pacifism had nearly cost us Tawang appeared in The Pioneer today. While the legacy of Jawaharlal Nehru is being discussed by ‘eminent’ personalities at the Nehru International Conference, organised by the Indian National Congress to commemorate Nehru’s 125th birth anniversary, it is perhaps time to stop using the usual clichés about the first Prime Minister’s 17 years at India’s helm. By the way, I seriously doubt if many of the invitees of the conference have read any of the 58 volumes of Nehru’s Selected Works. During the recent months, many have questioned the audacity to compare Sardar Vallabhbhai Patel to Nehru, but it is obvious that the Sardar would have been a far more decisive Prime Minister than the Pandit. Remember Kashmir. The future hero of the Bangladesh War then recalls: “As usual Nehru talked about the United Nations, Russia, Africa, God almighty, everybody, until Sardar Patel lost his temper. He said, ‘Jawaharlal, do you want Kashmir, or do you want to give it away?’ Nehru said, ‘Of course, I want Kashmir. Then [Patel] said, ‘Please give your orders’. And before he could say anything Sardar Patel turned to me and said, ‘You have got your orders’.” Without the Sardar, Kashmir would be Pakistani today. In February 1951, Tawang found its own ‘Patel’ in Jairamdas Daulatram, the Governor of Assam, (the Iron Man of India had passed away two months earlier). Daulatram ordered a young Naga officer to go and immediately begin administrating Tawang (the then Kameng Frontier Agency). A couple of years ago, an Indian journalist, Sidharth Mishra, provided a fascinating and detailed profile of Major Bob Khathing, the Naga officer in charge of the Sela sub-division: “In 1951, Major Bob Khathing commanded a force of 200 soldiers and re-established India’s sovereignty over Arunachal Pradesh, much to the annoyance of Jawaharlal Nehru.” Some other documents, such as the ‘official’ biography, Major Bob Khathing — The profile of a Nationalist Manipuri Naga by Lt Col H Bhuban Singh, complete the picture of Major Khathing’s expedition. An incident mentioned by Mr Mishra is worth a comment. Once the administration of Tawang was firmly under control, the bold Naga officer went back to Shillong to report to his mentor, Jairamdas Daulatram. Major Khathing’s direct interlocutor was Nari Rustomji, the Advisor to the Governor of Assam for the Tribal Areas. SN Haksar, an ICS officer serving as Joint Secretary in the Ministry of External Affairs, was at the receiving end in New Delhi. Nehru, being the External Affairs Minister, was undoubtedly regularly informed by Haksar of such a sizeable military expedition. It is possible that when Jairamdas Daulatram decided to send more than one hundred Assam Rifles troops (with over 600 porters) to Tawang, Nehru did not realise the implications of this decisive action for the nation. Retrospectively, it was a blessing for India as, if he had realised, Tawang would probably be Chinese today. A top secret report entitled, ‘Major Khathing’s Detailed Report About Tawang, sent in April 1951 by the Secretary to Advisor to the Governor of Assam to SN Haksar, is the best proof that the Prime Minister was in the loop. Nehru may have said: “Who asked you to do this?”, but the fact remains that he was informed. It is also a fact that it was legally the prerogative of the Governor of Assam to occupy any Indian territory under his responsibility and Tawang was definitely part of India since 1914. So, what was wrong in administrating a part of Indian territory? A Chinese study on the McMahon line admitted that at that time, the Chinese had no clue about the border between India and Tibet: “When the 18th Army led by [General] Zhang Guohua invaded Tibet, they still did not have a Tibetan map that they could use. They only had a rough and simple map of Tibet showing subdivisions. There was not even a standard road map. The names of the places and the villages were neither precise nor accurate.” It is only in 1954-55 that Mao Zedong discovered Tawang had been administrated by Tibet before 1914. Too late then for China to ‘liberate' Tawang! And thanks to Major Bob Khathing’s courage and swift action, it was too late for even Nehru to impose his pacifist views. This does not mean that Nehru was not a great man in many other respects. Yang Chuantang is an important member of 18th CPC's Central Committee and Minister of Transport of China. I am reproducing below his interview published by China Tibet Online. It is entitled Tibet’s transportation roadmap: Transport Minister. Yang Chuantang, a native of Yucheng, Shandong province, knows Tibet very well. Yang was first posted in Tibet in 1993; he then held the position of administrative vice-chairman of the Tibet Autonomous Region's (TAR) Government. He was later elected vice-governor of Qinghai province in 2003; in 2004, he returned to the TAR and became secretary of the CPC's Tibet autonomous regional committee (in other words, Party boss). Yang Chuantang served as Vice-Chairman of the State Ethnic Affairs Commission from 2006 to 2011 and in 2013, the old Tibet-hand became China's Transport Minister. Last months, I already wrote about the road network on the Tibetan plateau. What is interesting in the interview is the mention of the Fifth Tibet Work Forum held in January 2010. The Forum usually decides China's Tibet policy for the next decade. Infrastructure construction and maintenance to be continuously supported (by the Center). A public information platform to be set up for tourism, cargo and passenger transport. Better transportation facilities to be provided to support the national aid campaign for Tibet (financial support from other Chinese provinces). Of course, a crucial objective, the strategic and military one, is not mentioned in the interview. This gives a tremendous advantage to China vis-a-vis India particularly in the border areas (opposite India). Yesterday Xinhua announced that "China's vast and fast-growing high-speed rail network will extend into the Qinghai-Tibet Plateau as a route linking Xinjiang with inland is scheduled to start running through Qinghai Province next month. ...The train will run at a speed from 200 km/h to 250 km/h on the plateau, reducing the travel time between Qinghai capital Xining and Gansu capital Lanzhou to one hour. 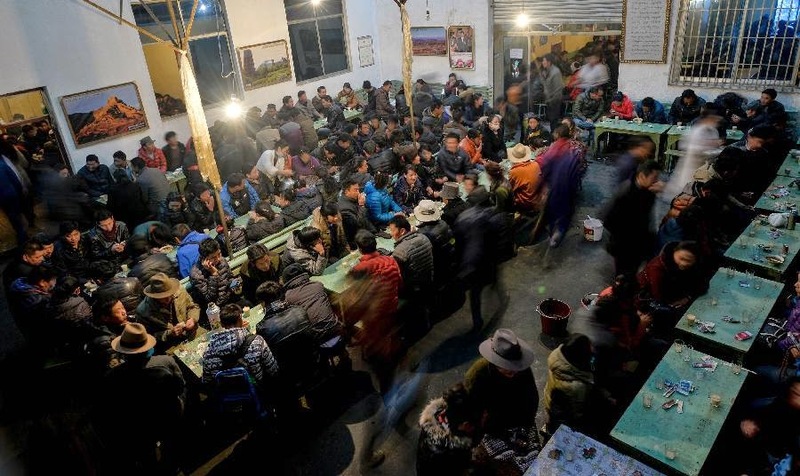 After the operation starts, it will only take seven hours for a train to run from Xining to Urumqi, capital of Xinjiang Uygur Autonomous Region." Chao Yang, chief engineer of the Qinghai division explained: "It marks China has mastered technologies of making and operating high-speed trains in areas of high-altitude and extreme low temperature." Xinhua added: "The high-speed rail is expected to spur the growth of tourism, mining and trade on the Qinghai-Tibet Plateau." And it will tremendously enhanced the military infrastructure! 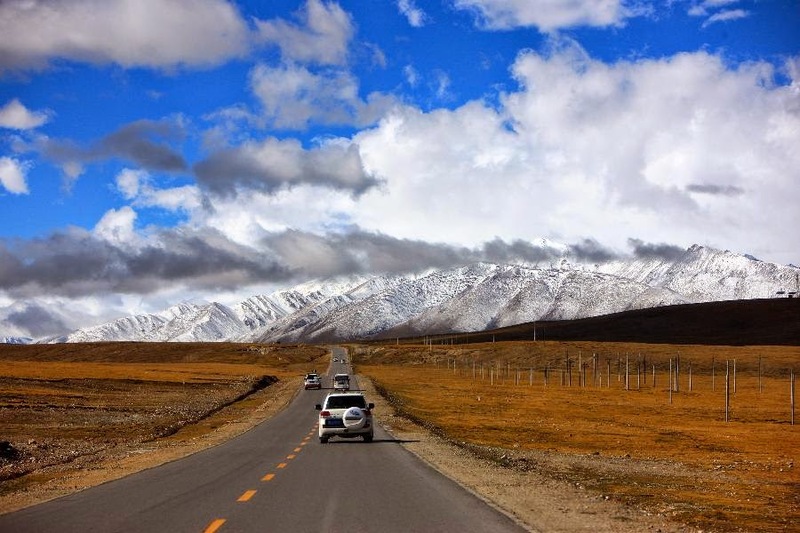 The Qinghai-Tibet Highway and the Sichuan-Tibet Highway were constructed under harsh natural conditions over five years, which is a miracle in the history of highway construction on the 'Roof of the world'. The opening of the two highways has ended the days when there was no highway in Tibet, and has also changed Tibet’s traditional mode of travel and created a new epoch in the course of transportation in modern times. For some time now, 95 percent of aid goods have been shipped to Tibet via the highways. 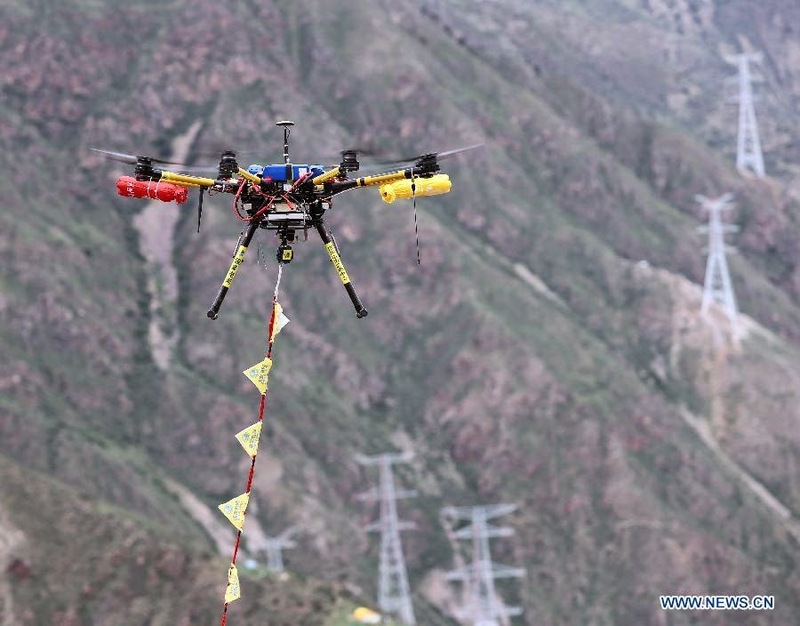 On top of this, supplies for 105 key projects, equipment for quake relief, and construction materials for the Qinghai-Tibet Railway have also been transported into Tibet through the highways. In terms of construction, the Qinghai-Tibet and Sichuan-Tibet highways were the most difficult, complex, and challenging of the time. How to maintain smooth transportation along them is also a hard nut to crack. 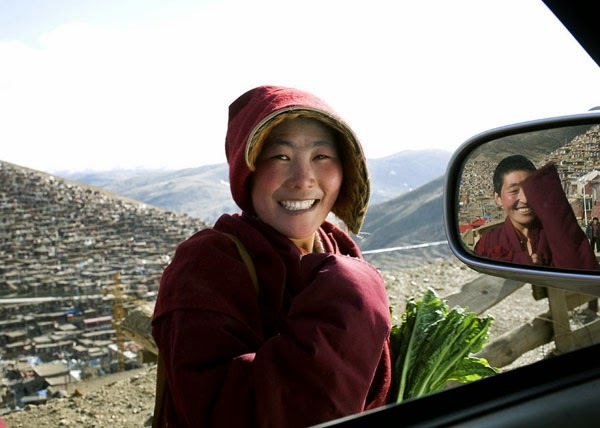 The past six decades have seen rapidly improving developments in Tibet’s transportation system. By the end of 2013, the total mileage of Tibet’s highway had reached 70,000 kilometers, with 20 national and regional routes, 71 roads, and many rural roads with Lhasa as their center. These new roads and highways form a network covering three economic zones in the central, eastern and western parts of Tibet. Besides, there are five airports of civil aviation in Tibet, with 48 domestic and international airlines reaching as far as Beijing, Chengdu, Hong Kong and Kathmandu as well as another 25 cities. The first extension of the Qinghai-Tibet Railway from Lhasa to Shigatse was completed and put into operation in August this year. Apart from the geographical conditions and harsh climates, maintaining Tibet’s highways is also very difficult. For example, the frozen earth on the Qinghai-Tibet highway made it difficult to maintain a smooth road surface, and the Sichuan-Tibet highway has been stricken by frequent natural disasters such as rainstorms, landslides and mudslides. Even after the two highways were completed, a lot of improvements and enlargement have been made to keep transportation running smoothly along them. 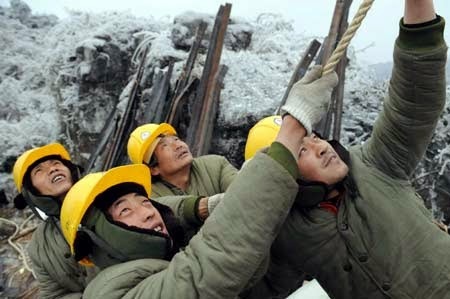 In the past 60 years, 9.7 billion yuan has been invested in the renovation of the two highways, and 600 experts have been dispatched to Tibet to upgrade and apply new technologies to the building of roads on frozen earth, building of bridges, and highway maintenance. 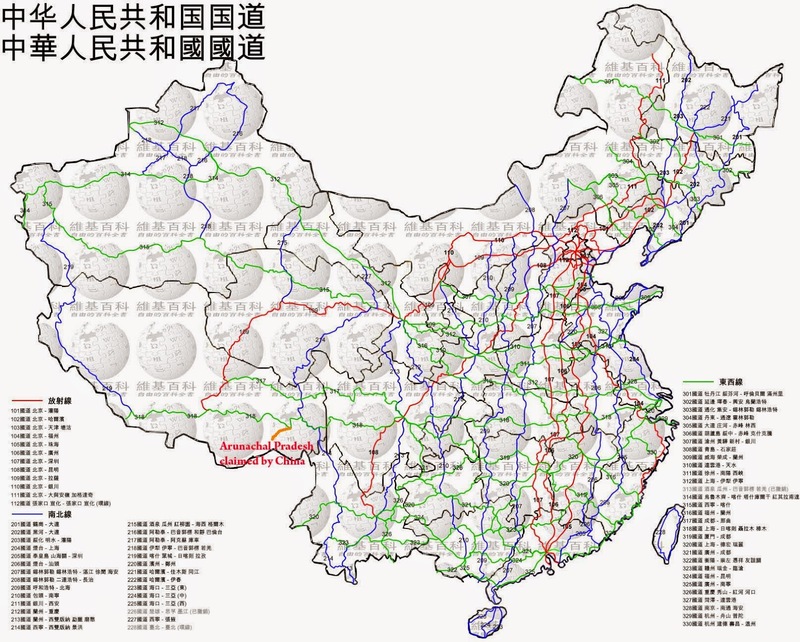 At present, the main roads including the National Highway 109 (the Qinghai-Tibet Highway), the National Highway 214 (the Yunnan-Tibet Highway), the National Highway 219（the Xinjiang-Tibet Highway）, the National Highway 317（the Sichuan-Tibet Highway）and the National Highway 318（The southern part of the Sichuan-Tibet Highway）have been basically paved, forming a highway network in the Tibet Autonomous Region. 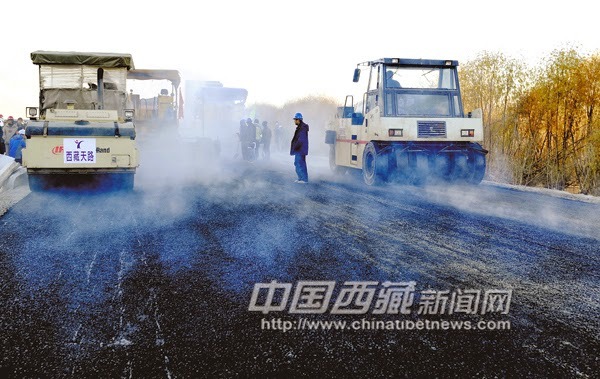 The expressways in Tibetan-inhabited areas of Sichuan and Qinghai are also currently under construction. The past two decades have seen huge developments in Tibet’s transportation system. However, Tibet’s transportation still lags behind when compared to that the national average level. A general guideline was put forward at the Fifth Conference on the Work of Tibet in 2010 that transportation should be developed first in order to fulfill the goal of building a society of moderate prosperity in all aspects by 2020. First, a reform in investment and financing mechanisms will be conducted. Second, a fast and comprehensive transportation network covering Lhasa and six prefectures will be set up, and a plan based on the comparative advantage of each means of transportation will be made. Third, infrastructure construction and maintenance will be supported continuously. In the 13th Five-year Plan period (2016-2020), heavier investment will be made in the building and maintenance of highways for national defense, national and regional highways, and rural roads. Management on the maintenance of these roads will also be strengthened, and the capacity for emergency response will be improved. Fourth, a public information platform will be set up because highways are the most important means of transport in Tibet for tourism, cargo and passenger transport. Transport infrastructure at border ports will also be improved. 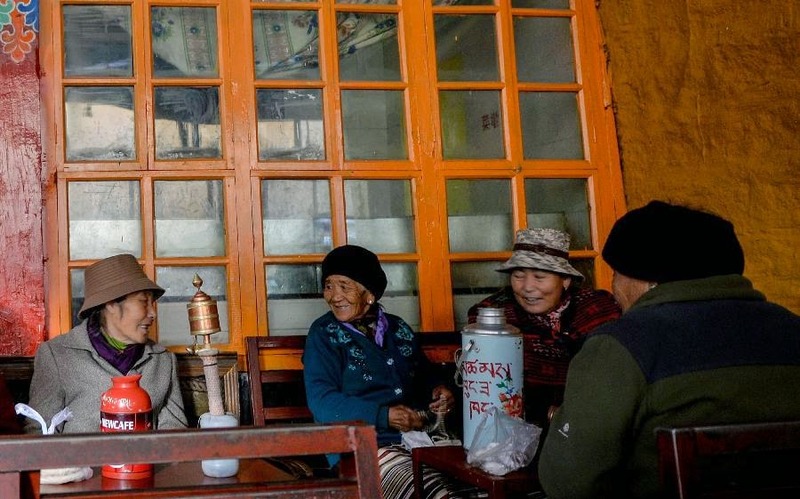 Fifth, better transportation facilities will be provided to support the national aid campaign for Tibet in matters of finance, cadres, personnel, education, science and technology, and management. Tibet will also coordinate with the national departments concerned for more funds, technical support and experts for the future development of its transportation system. My article China’s New Silk Road must steer clear of terror haven Pakistan appeared in NitiCentral. Can China isolate itself from developments happening on the soil of its ‘all weather friend’ Pakistan? Will not the New Silk Road, which will allow free circulation of goods and people, be the perfect vector for further spreading terrorism? This week witnessed the frostiest Handshake of the Year. Twenty seconds worth watching (especially, the faces of the 2 leaders)! But that was a thaw, a small beginning! Also, US President Barack Obama and Russian President Vladimir Putin ‘circling each other warily at a global summit in China’ as Associated Press put it: “On the surface, were all niceties — a pat on the back here, a pleasantry there,” but tough goings during three separate encounters. And the most awkward — in a chilly night of Beijing, a chivalrous Vladimir Putin’s wrapped a shawl around the shoulders of Peng Liyuan, Xi Jinping’s wife. That is just not done in today’s China. It was probably better for Narendra Modi to have skipped altogether the mega event. His presence could have hardly helped advance India’s interests. Indirectly interesting for India was Xi Jinping’s pledge to grant $40 billion to a Silk Road Fund for the infrastructure of his pet project. Xi stated this would alter the economic landscape of a vast area stretching from Asia to Europe. It could ultimately be a conduit for destabilising the Middle Kingdom. As Xi met with leaders of Bangladesh, Cambodia, Laos, Mongolia, Myanmar, Pakistan and Tajikistan, he made a five-point proposal to promote the interconnectivity in the larger region. It is not clear how the new Silk Road Economic Belt would reach Bangladesh, though Xi’s second baby, a 21st Century Maritime Silk Road, will certainly use Bangladesh’s harbour facilities. Amazingly, Xinhua quoted Rahman saying the project would contribute immensely for easy exchange of knowledge and ideas, who cited the construction “of a second rail line, this time from Lhasa to Nyingtri to the east, parallel to India’s Arunachal Pradesh.” Probably the first time, that Xinhua speaks of ‘India’s Arunachal Pradesh’. 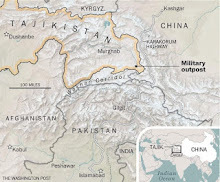 On the sidelines of the Summit too: “Islamabad pledges assistance in Beijing’s anti-terror fight against militants said to be active in the restive western Xinjiang Uygur Autonomous Region,” said Reuters. Don’t laugh! It is what the Pakistani Prime Minister Nawaz Sharif stated during his meeting with President Xi Jinping. Though most analysts doubt the existence of organised terror groups in Xinjiang, Beijing regularly blames ‘terrorists’ of the East Turkestan Islamic Movement for carrying out attacks in the restive region. Sharif also promised to increase Islamabad’s coordination with Beijing on Afghanistan to ‘jointly maintain regional peace and stability’. This tall promise comes at a time when the Islamic State in Iraq and Syria (ISIS) also known as Islamic State (IS) is said to have heavily recruited in Baluchistan. The IS would plan to attack military installations and Government buildings in Khyber Pakhtunkhwa in retaliation to the army-led Zarb-i-Azb operation in North Waziristan and also target members of the minority Shia community. The warning comes days after six top commanders of the outlawed Tehreek-i-Taliban Pakistan (TTP) have announced their allegiance to the new caliph Abu Bakar Al-Baghdadi. Can China isolate itself from these developments happening on the soil of its ‘all-weather friend’? Will not the New Silk Road, which will allow free circulation of goods and people, be the perfect vector for further spreading terrorism? Has Xi Jinping thought of this possibility? He can’t certainly be reassured by the Pakistan’s empty words. On October 16, China Military Online reported that Major General Asim Saleem Bajwa, director general of Inter Services Public Relations of Pakistan, was on a 5-day visit to China. The general bragged that the border management between China and Pakistan was very effective, and the security on both sides was closely coordinated. Bajwa denied the rumour that terrorists from China’s Pishan County were trained in Pakistan: “There are no facilities or infrastructure for any training by any kind of terrorists across the China-Pakistan border”, he asserted. It is touching, isn’t it? If true, it is good, but what about The Dawn’s information? 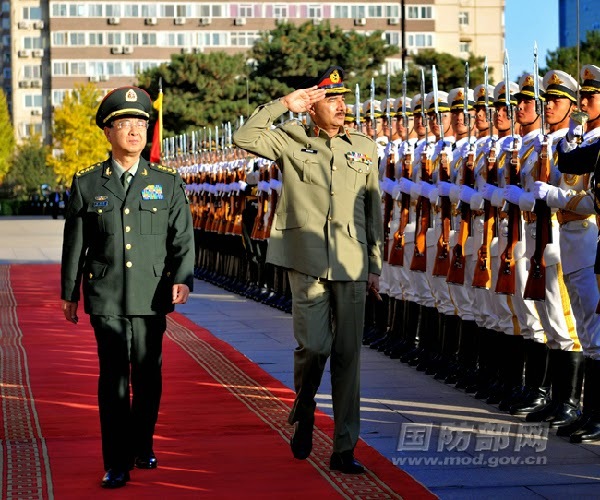 China Military Online reported that the Pakistani Chairman of the Joint Chiefs of Staff Committee, General Rashad Mahmood was also seen in Beijing, beginning of November. He met the Vice Chairman of China’s Central Military Commission Xu Qiliang who hailed ‘the mutual support between China and Pakistan on core-interest related issues’. He thanked China “for its support of Pakistan’s sovereignty, independence and security.” Does it mean that without China, Pakistan would cease to exist? In the meantime, China has jailed almost two dozen people, including ‘wild imams who preach illegally’ in Xinjiang. Xinhua announced that during a mass public sentencing, 22 suspects were sentenced to prison terms ranging from five to 16 years. One thing is for sure: China takes more seriously the issue of terrorism than Pakistan. It would perhaps be in the interest of the leadership in Beijing to close down the branch of the New Silk Road going to Pakistan and let their ‘loved Pakistani brothers’ sort out their own problems (‘remain in their own juice’, as the late B Raman once wrote). The new Silk Road could certainly wait. An old dream of mine has been fulfilled: the Nehru papers have been transferred from the heir of the Nehru family (Sonia Gandhi) to the Government of India (Prime Minister's Office). The 'Papers' are not 'private' anymore. Last week, I had again written on my favourite topic in The Statesman. The Indian Express yesterday reported that "Sonia Gandhi, Nehru’s granddaughter-in-law and the legal heir of his papers, has written to the [Nehru Memorial Museum and Library] to say that the family would have no problems if scholars were given access to them, it is reliably learnt." From now on, permissions will be given by the Prime Minister's Office. The Indian Express commented: "It is believed that this move by Nehru’s legal heirs is intended to counter impressions about Nehru’s position on several key developments of his time as PM, for example, regarding Kashmir or China." Let us hope that this help to have a more balanced knowledge of the life and works of the first Prime Minister of India. During the first meeting of the National Committee for the Commemoration of Jawaharlal Nehru’s 125th birth anniversary, Prime Minister Narendra Modi expressed the hope that the commemoration’s activities would be conducted in such a way that the common man became a part of the celebrations. That is nice. Apart from the ‘Bal Swachhta Mission’, Mr Modi spoke of the ‘promotion of scientific temper among children’ as a prominent objective of the celebrations. That is exciting. A host of eminent academics, scholars, retired bureaucrats and army officers took part in the deliberations of the committee; an interesting inclusion was the Director-General (DG) of National Archives of India (NAI), though it is true that the NAI has no permanent DG since Prof Mushirul Hassan left in May 2013, showing the lack of government interest for scholarly work and research. As the Prime Minister invited suggestions on other possible subjects which could be included in the programme of the celebrations, I will give mine. I believe that it would be the ideal occasion to promote the love of historical research among children and adults. In this context, the committee should open to the public what are known as the Nehru Papers (also referred to as the JN Collection) kept in Teen Murti Bhavan, and this without any restriction. It has been one of the greatest enigmas of ‘modern’ India: how can the correspondence, notes, speeches of the first Prime Minister of India be considered ‘private’ and why should it be kept under the custody of one ‘private’ person (Mrs Sonia Gandhi)? The State’s papers should never be ‘privatized’. Apparently, Nehru had willed all ‘his papers’ to an organization to be created after his death (Jawaharlal Nehru Memorial Fund). However, Nehru did not specify that thereafter special permission of the custodian would be required to access any file/document. Apparently, his daughter, Indira Gandhi added the odd rule that it should remain in the custody of her family. The end result is that the Nehru Papers do not come under the Public Record Rules, 1997, which state that records after 25 years or more must be preserved in the NAI (and that no records can be destroyed without being recorded or reviewed). While legally, it is mandatory for each Government’s department to prepare a half-yearly report on reviewing and weeding of records and submit it to the NAI, the Nehru Papers are exempted. It would be fine to keep the papers as a ‘collection’, if they were openly available to the general public. The Nehru Papers are an invaluable collection dealing with all topics under the Indian sky, looked after by the Prime Minister (Nehru was also Foreign Minister from 1947 till his death in 1964). One can argue that the JN Collection is not completely closed; if one is ready to follow the cumbersome process and write to the ‘custodian’, one has technically a chance to have a darshan of the said file/letter. But why always complicate the researcher’s life? One can hope that the committee for Nehru’s 125th anniversary will put this issue on its agenda, and as an offering to the memory of the first Prime Minister, will make his fabulous collection of historic documents available to each and every one in India (and abroad), wanting to study Nehru’s works. It can be argued that the Nehru Papers have been partially declassified through the publication of more than 55 volumes of the Selected Works of Jawaharlal Nehru (1947-1960), but for a researcher this selection cannot replace the ‘real thing’. Further, though the policy has been changed for the most recent volumes, the editor used to resume with a few words the letter/event/note which had triggered the Prime Minister’s answer; to read the interlocutor’s full questions/queries helps to better understand Nehru’s answer. The committee would do India a great favour by opening the entire collection to the public. Speaking recently at the 42nd annual convocation of the All India Institute of Medical Sciences (AIIMS), the Prime Minister said: “While Indian doctors have made a name for themselves across the world, the country needs to step up medical research, to keep pace with a fast-changing world. We should focus on research, particularly on case history. This can be a big contribution to humankind”. It is not only in the medical field that research and scientific temper should be promoted, but in the historical field too, it should be encouraged. Young (and less young) Indians should be persuaded to research and dig in the past (the glories as well as the goof-ups) in order to better face today’s reality. 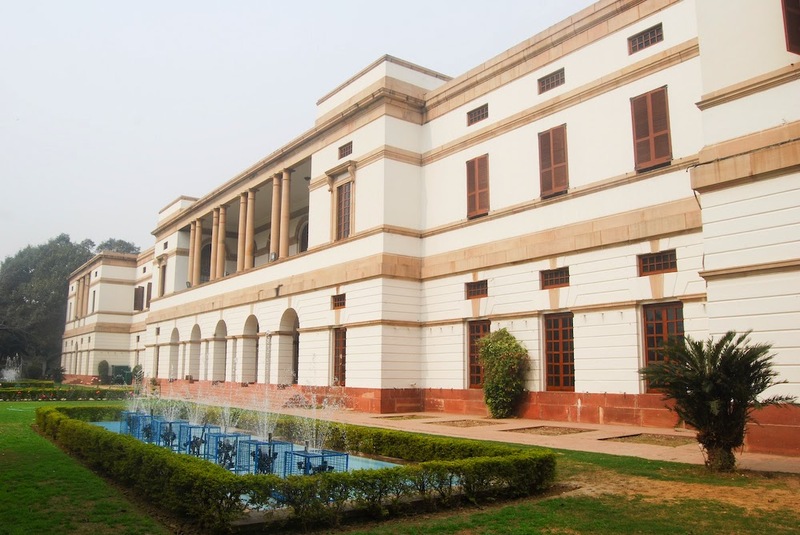 Let me tell you my personal experience in the National Archives of India which I have been frequenting for the past 15/20 years. Every two years, I have to reapply from scratch and prove again that I am still a ‘scholar’. Being born in France, I have to bring a certificate from the French authorities ‘proving’ that I am still a ‘researcher’. Though the French Embassy has always readily obliged, why can’t I be a ‘scholar’ for life? When I ask the NAI staff, I am invariably told: “No Sir, this is the rule in India, you can be a scholar for two years only.” What nonsense! If the Prime Minister wants to build a nation of researchers ‘with scientific temper’ there are many rules to drop and many vaults to open. Today, a string of antiquated rules and regulations, red-tapism and an obscurantist mindset not worthy of a dynamic country like India, remain in place. As a result, Indian history continues to be buried. Is it the hallmark of a mature nation? The opening of the Nehru Papers would be the greatest homage to Nehru and an exceptional opportunity for scores of young scholars to see what went right (and what went wrong) in Modern India. As India should not forget Patel, it should also not forget Nehru. For this, the Nehru Papers should become ‘public papers’; why should they forever remain ‘private’? That would be a national tragedy. IT is very fashionable to write about Tibet. You get a couple of interviews with the Dalai Lama; you pay one or two visits to Dharamsala, the ‘Little Lhasa’ in Himachal where the Tibetan leader lives in exile since 1960; you write a few chapters on human rights’ violations in ‘occupied’ Tibet, without forgetting the horrendous self-immolations and that is it. You have got the right cocktail to profitably sell your book and propagate the usual clichés about the Tibetan Diaspora and their cause. 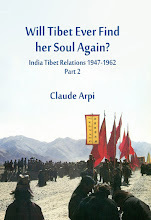 The book under review is different, primarily because Yeh has been to Tibet; she lived with Tibetans and speaks perfect Tibetan as well as the ‘new’ language (Chinese). Further with her academic background, she has been able to understand and analyse the issues at stake. 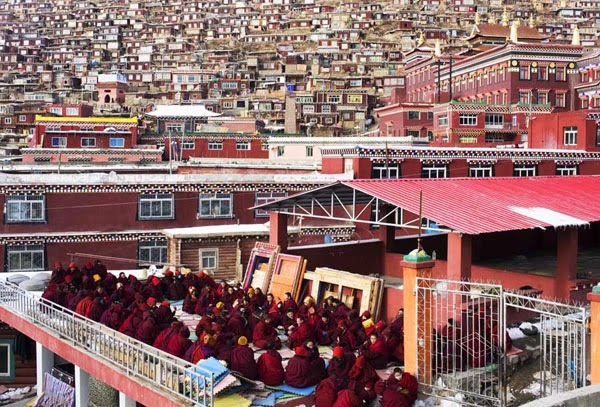 For 13 centuries, the Central Cathedral in Lhasa has been the ‘heart’ of Tibet and despite the Communist takeover in 1950, scenes like in Jokhang can still be witnessed; it is what makes Tibet so different from any other nation living under a ‘foreign’ yoke. The outside landscape has however greatly changed during the past 50 years or so. 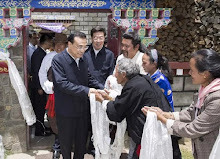 Yeh notes that the ones prostrating are only pilgrims and old local Tibetans, not students, Chinese Communist Party members or Tibetans employed by government; they would get into serious trouble with the party, if they dared to do so. Secretary Chen’s position is not new, but one could have hoped for a softening of Beijing’s Tibet policy with the arrival of President Xi Jinping on the scene. Bhikruti, the Emperor’s Nepalese wife has been sent to the oubliettes of history; it would not be 'politically correct’ to tell mainland Han tourists that the wisdom (i.e. Buddhism) came from the Indian subcontinent. 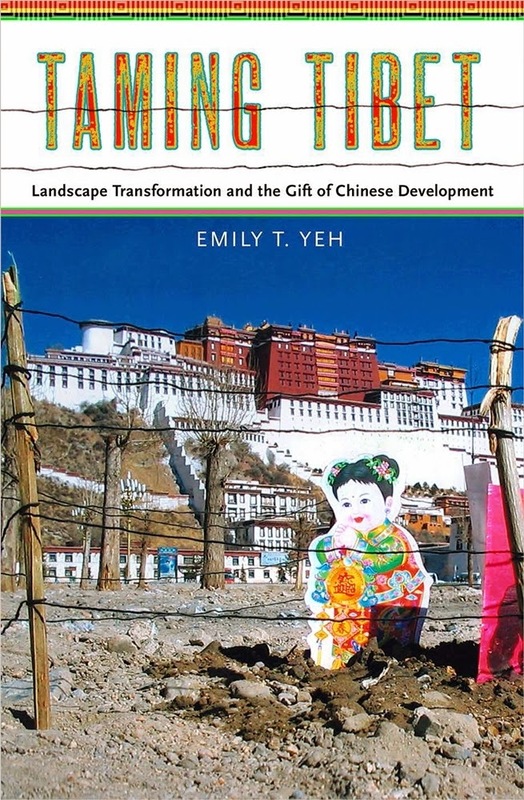 Yeh’s Taming Tibet, is the result of sixteen months of ethnographic fieldwork between 2000 and 2009. 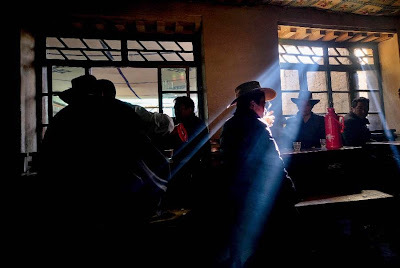 “Yeh traces how the transformation of the material landscape of Tibet between the 1950s and the first decade of the twenty-first century has often been enacted through the labor of Tibetans themselves”, says her publisher. Some particularly fascinating chapters deal with “Cultivating Control: Nature, Gender, and Memories of Labor in State Incorporation”, of Tibetan landowners preferring to rent their land than cultivate themselves, often becoming prey to unscrupulous migrants who refuse to pay their due; captivating too is Yeh’s analysis of “Indolence and the Cultural Politics of Development”, which shows that Tibetans prefer ‘indolence’ and accept the present situation without protesting too much (except when violence erupts like in 2008). Tibet is fast becoming the largest entertainment park in the world; a thousand times larger than Disneyland. The leadership in Beijing has found a more sophisticated way to submerge the Tibetan population under waves of Han Chinese. 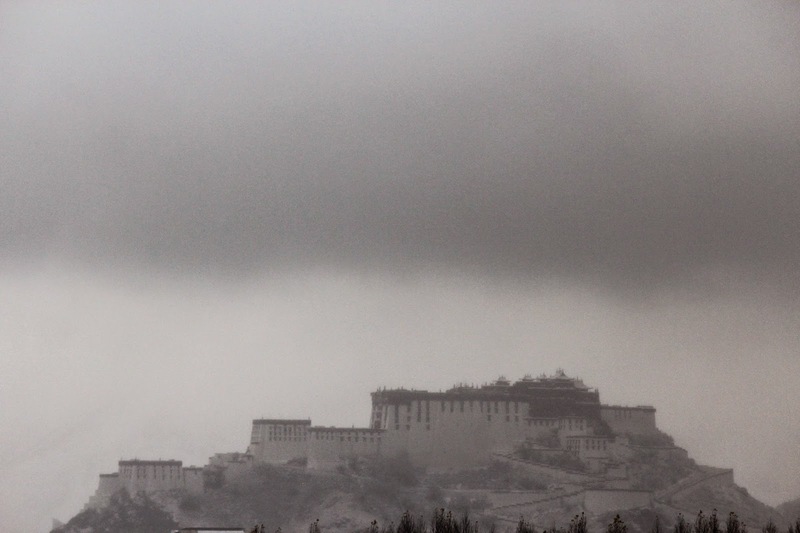 Tibet has two unique assets: first, its physical reality. The beauty of the landscape, the imposing mountain ranges, the purity of the air and the rivers, the dry pure sky. The second advantage is the rich historical past of the Roof of the World, the mysterious Land of the Lamas. In Tibet, you can find everything, says the Chinese propaganda: the monasteries and nunneries, seat of a wisdom lost in the mainland; the folkloric yak or snow-lion dances, etc. Of course, the ‘locals’ are not always reliable and their knowledge of Mandarin is often not that good; it is not so important as the shows can go on without them. When 13 millions of ‘tourists’ pour in a relatively small place like Lhasa, one has to be ready to ‘receive’ them and provide them ‘entertainment’. It is what the Party does. In the last three years, the Communist leadership has managed to completely change the ‘landscape’ of the Roof of the World. It is a real tragedy. Yeh’s book is a scholarly and refreshing addition to the study of the ‘Chinese gift of development’ to inhabitants of the Roof of the World. 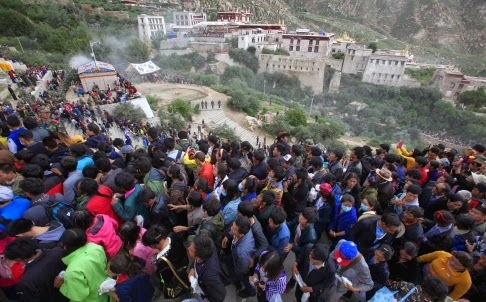 A Chinese website, VTIBET.com recently reported about 'Warm and Sweet Life in Lhasa'. The article speaks of numbers of teashops serving sweet milky tea in the Tibetan capital: "In Tibet, no morning is complete without sweet tea. 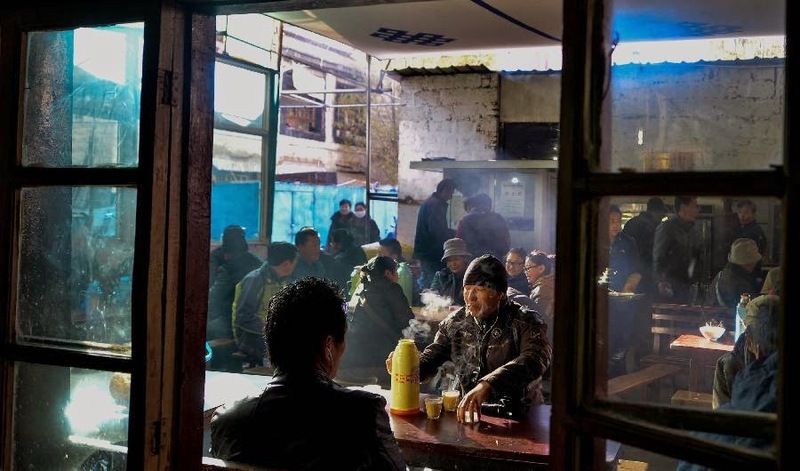 Drinking sweet tea in the morning is a necessary part of Tibetans’ daily life in Lhasa", explains the article. The reporter continues: "The predecessor of Tibetan sweet tea is said to be British black tea, brought by the British in the 19th century. Sweet tea is a kind of ivory yellow liquid and is made from black tea, milk and sugar for fully mixing, which smells good and sweet." Isn't it what we call 'chai' in India? It is what the Prime Minister Modi used to serve on the railway platforms in his younger days. Where did this habit come from? 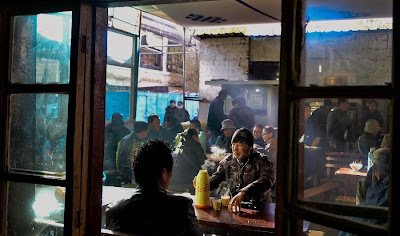 The article says: "Now, sweet tea houses in Lhasa scattered everywhere, Guang Ming Gamchung Tea House, Guang Ming Tea House, Tsamkhung Nunnery Sweet Tea House and so on are the most famous. 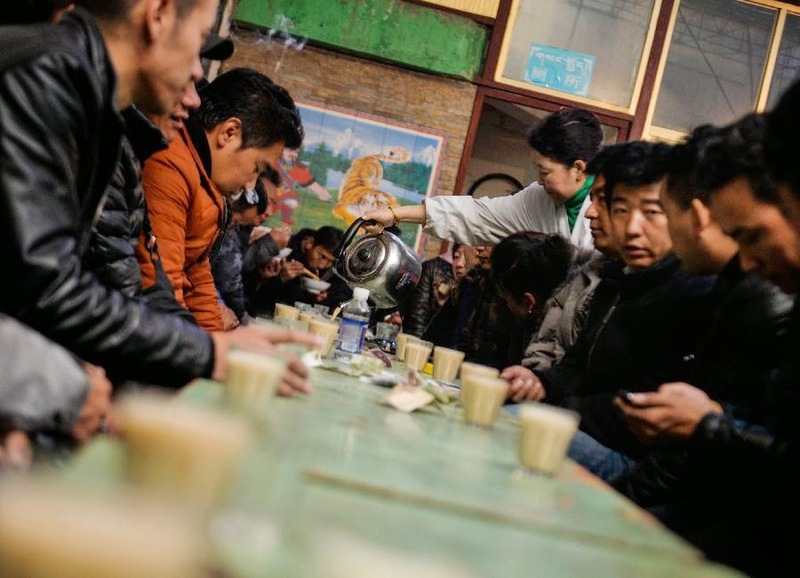 As a tradition, the tea houses open at half past eight in the morning and close at seven o'clock in the evening with overwhelming customers in an endless stream. Locals often chat with each other at tea houses, drinking sweet tea when thirsty and eating Tibetan noodles and buns when hungry." 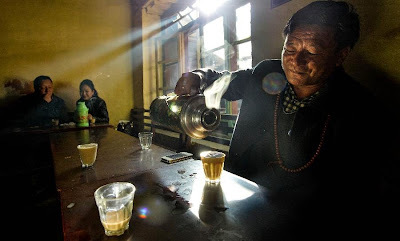 It does not explains why the Tibetan have dropped their traditional bod cha or salted butter tea for an 'Indian' chai. Is it a political statement? 'It is certainly time for New Delhi to open up. Not only should it go ahead at full steam with the roads to the LAC, but the government must also allow tourists to visit these stunningly beautiful areas of Indian territory,' says Claude Arpi. China is unhappy about India's plans to build a road on the southern side of the McMahon Line in Arunachal Pradesh. 'We should jointly safeguard peace and tranquility of the border area and create favourable conditions for the final settlement of the border issue,' he further asserted. The proposed billion dollar project on the Indian side of the India-Tibet border was announced by Union Minister of State for Home Affairs Kiren Rijiju during a visit to his home state, Arunachal Pradesh. One could, of course, have asked Hong when China decided to build a road through the Aksai Chin plateau in the early 1950s, was not Beijing 'complicating' the border issue with India? Yang's remarks were made in response to a question about Delhi's plan to build 54 border posts in Arunachal Pradesh ('Southern Tibet' for Beijing). China, which has built extremely good roads to the LAC, objects to India struggling to build infrastructure to her side of the LAC where the terrain is extremely difficult. 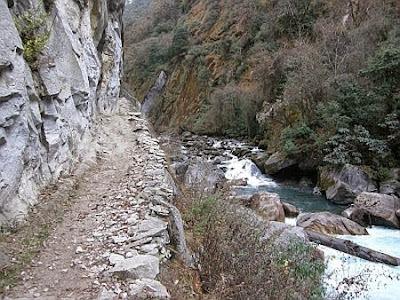 From the Indian side, there is a strange feature to the plan announced by the government: The road would run parallel to the LAC in Arunachal Pradesh. Even for a non-expert, it makes sense to reach the LAC by following the valleys and rivers, all flowing in a north-south direction. Who had this awkward idea, to say the least, to cut across the mountain ranges to have a road 'parallel' to the McMahon Line? When I asked an Arunachalee friend who knows the area well, what he thought of the 'parallel' road, he just laughed, he did not even want to answer. Are some people in Delhi or Itanagar trying to sabotage the entire project whose main objective is to reach troops to the border as quickly as possible in case of conflict? Religion: a Poison no more? 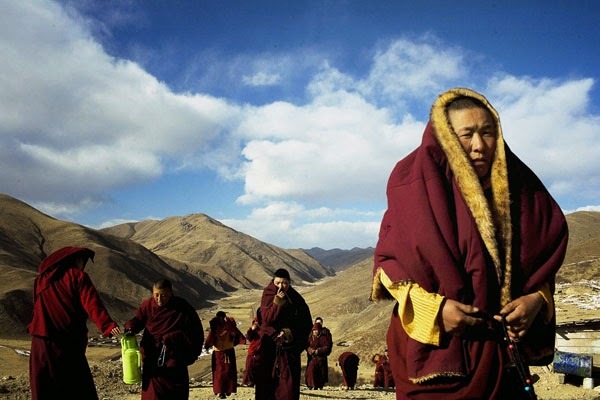 In August, I wrote on this blog: "Communist China is fast becoming expert in Tibetan Buddhism. Unfortunately, though Beijing shows a great interest in the Tibetan Tradition, it is not enamoured with the Dalai Lama as yet." Last week, Chen Quanguo, Tibet's Party Secretary told the Standing Committee of the regional Party: "One should not believe in the 14th Dalai group’s fantasies (illusions), or follow the Dalai group; one should beware infiltration and sabotage activities in which are involved separatist party cadres." While warning the cadres not be trapped in the 'Dalai Lama's fantasies', the Party is promoting Buddhist on a large scale in Eastern Tibet (Kham). An article on China Tibet Online praises "Larung Gar Five Sciences Buddhist Academy in Sichuan" pointing out that Jigme Phuntsok Rinpoche, founder of Larung Gar was a teacher of His Holiness [sic] the Thirteenth Dalai Lama (of course, they won't say that the same Khenpo Phuntsok once visited Dharamsala to share teachings with the present Dalai Lama). Jigme Phuntsok Rinpoche, the incarnation of the great terton Terchen Lerab Lingpa, and also a teacher of His Holiness the Thirteenth Dalai Lama, established the Larung Gar Five Sciences Buddhist Academy in Larung Valley near Serthar, Sichuan Province, southwest China, in 1980, with the aim to revitalize Dharma and benefit all sentient beings. The reason behind the selection of Serthar as the building place is primarily based upon the fact that it is a historically sacred place in Vajrayana. Monks go to achieve 'rainbow body' (a high level of spiritual achievement), and comprehend the 'four karmas' at the academy. 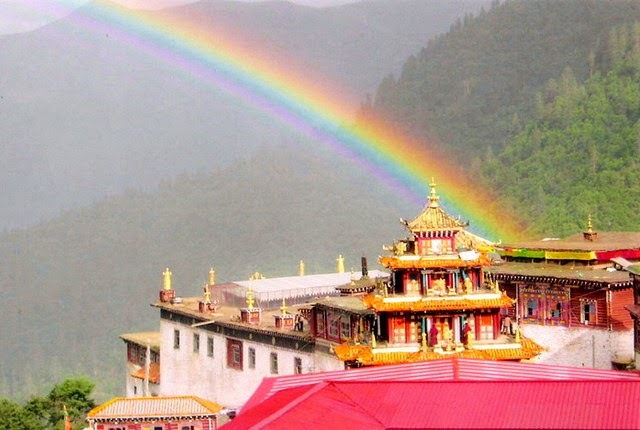 Thirteen disciples attained 'rainbow body' at the place where His Holiness the First Dudjom Rinpoche had originally stayed. According to the First Dodrupchen Rinpoche, two hundred years ago a great siddha wrote in his Future Prophecy that the Larung Valley, protected by the Goddess of Mutian and surrounded by the sacred Mt. Danjian and Mt. Ala, is a blessed site. The aim of the academy can be summarized by four distinct pursuits: "to unite Buddhists in harmony; to uphold pure precepts; to study, reflect upon, and practice the sacred Dharma; and to propagate the Dharma and benefit all beings". In May of 1987, the Tenth Panchen Lama approved the founding of the academy by presenting them with a plaque on which he wrote, in Tibetan: "Larung Gar Five Sciences Buddhist Academy", he also respectfully addressed His Holiness Jigme Phuntsok as "Sage Choeje". At the same time, Mr. Puchu Zhao, the Chairman of the Buddhist Association of China, wrote the name of the academy in Chinese. 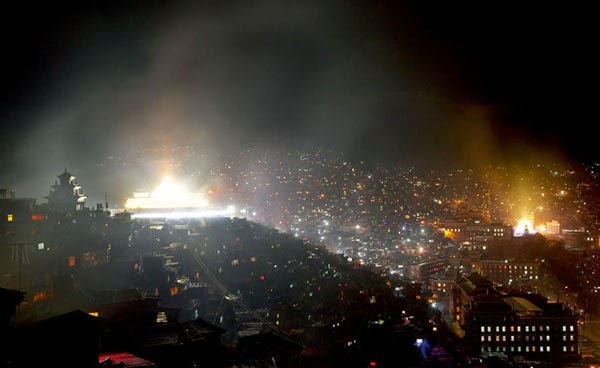 Therefore, an era of revitalization of Tibetan Buddhism had begun. According to the introduction of its website, the curriculum at Larung Gar Five Sciences Buddhist Academy includes three parts: Sutrayana, Secret Mantrayana, and common culture. The main courses in Sutrayana involve five major categories of treatise: Vinaya, Hetuvidya, Abhidharmakosa-Sastra, Madhyamika, and Prajnaparamita. Secret Mantrayana consists of esoteric shastra, various preliminaries, generation phase, completion phase, the Great Perfection, and pith instruction. Common culture pertains to the science of language, the science of medicine, Tibetan language, etc. 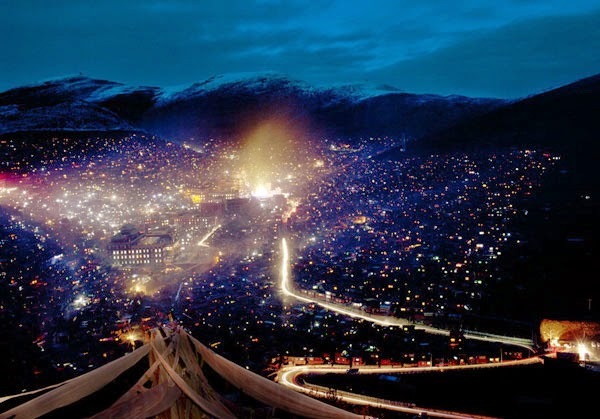 In 1999, the Larung Gar Five Sciences Buddhist Academy was identified by The New York Times as one of the largest and most influential centers for study of Tibetan Buddhism in the world. During more than 30 years, the academy has cultivated hundreds of eminent Buddhist scholars and practitioners, who in turn have founded numerous Dharma centers around the world. They have also made tremendous contributions to Tibetan Buddhism by teaching the sacred Dharma, revitalizing the traditional Tibetan culture, and improving ethnic unity. 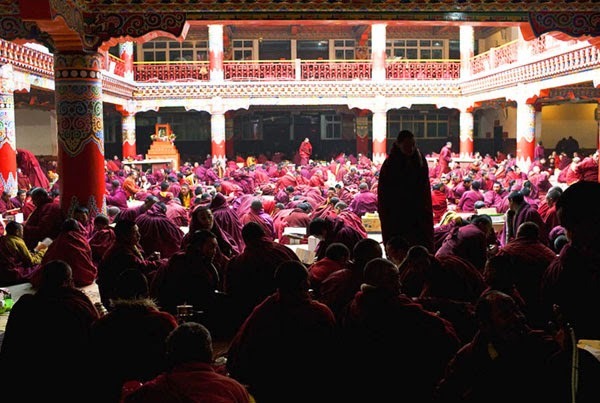 Currently, there are over ten thousand resident monastics, both Tibetan and Han, in the academy. In addition, thousands of members around the world are engaged in Dharma study via online courses taught by the institute's senior Khenpo, Sodargye Rinpoche. While denying the existence of the Dalai Lama as one of the foremost proponent of Buddhism, Beijing has clearly become 'expert' in the Buddha Dharma. By the way, did you know that Confucius ruled as a 'divine king' in Tibet? It is what the China Daily says: "Thanks to cultural exchanges between ethnic Hans and Tibetans, Confucius became a master in Tibetan culture over time." The Communist newspapers explains: "In the beginning, Confucius’ name could only be found in Tibetan literature that was translated from Chinese. Gradually, Confucius became known as a figure with 'divine power' in Tibet and took on the identity 'Kongtse Trulgyi Gyalpo', founder of literature on calendrical calculation and rituals to ward off evil spirits in the Bon religion, Tibet’s traditional religion." Confucius was a Bon master. The article seriously adds: "In order to promote the Bon religion, Confucius traveled to many places far away from home, and learned from masters until he finally built a monastery of the Bon religion. However, he wasn’t able to protect the monastery on his own, so he invited Shenrab Miwoche to help out and later regarded Miwoche as his master. Around the time Tibetan Buddhism replaced the Bon religion and took on a predominant role in Tibet, Confucius was considered as one of the four leading masters of the Bon with divine power." Great, by why did Mao say that 'Religion is Poison'? 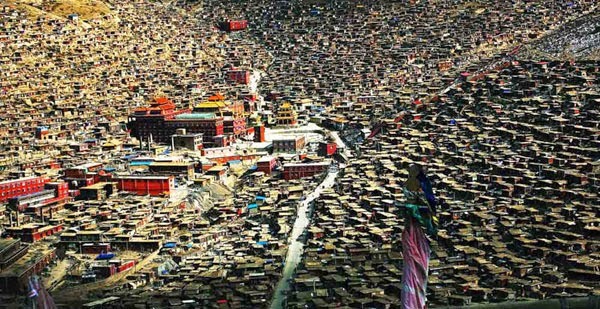 Here are some pictures of Larung Gar. 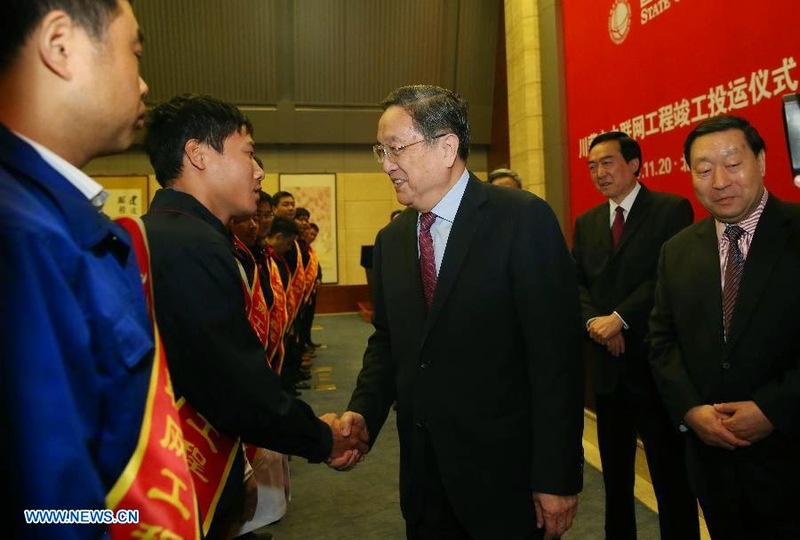 A couple of days ago, Reuters reported that Chen Quanguo, the Party Secretary in the Tibetan Autonomous Religious (TAR) vowed to severely punish Communist cadres in Tibet who 'harbor fantasies' (or illusions) about the Dalai Lama. 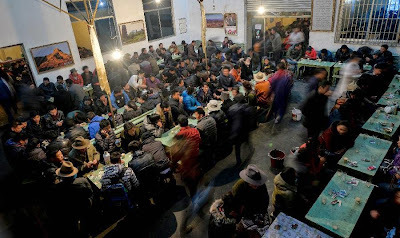 The article quoted by Reuters appeared in a front-page of The Tibet Daily: "As for cadres who harbor fantasies about the 14th Dalai [Lama] Group, follow the Dalai Group, participate in supporting separatist infiltration sabotage activities, (they will be) strictly and severely punished according to the law and party disciplinary measures." Reuters concluded that "Chen's denunciation of the Dalai Lama signals a hardening stance against the Nobel Peace Prize winner whom they label a 'wolf in sheep's clothing'." Voice of America quoted Ye Dongsong, a senior official of the Central Commission for Discipline Commission (CCDI), the party's internal discipline watchdog, who headed an 'inspection team' to Tibet and warned the local authorities to focus on 'neutralizing separatists and maintaining social stability'. Ye would have said, "some officials in Tibet still sympathize with the Dalai Lama because of their religious beliefs." VOA added: "The article provided no estimation of how many Communist Party officials have sympathies or links with the exiled Tibetan spiritual leader." The context of Chen's remarks is a meeting of the Standing Committee of the TAR Regional Party which followed Ye Dongsong's visit to Tibet to check on the corruption of the local Party. Since President Xi Jinping started his campaign to catch 'the tigers and the flies' involved in corruption, CCDI's teams have been roaming around the Middle Kingdom to unearth corruption. Many heads have already rolled down, including in the PLA (the latest being Lt. Gen. Yang Jinshan, a former Commander of the Tibet Military Area, see The Fall of A powerful General). 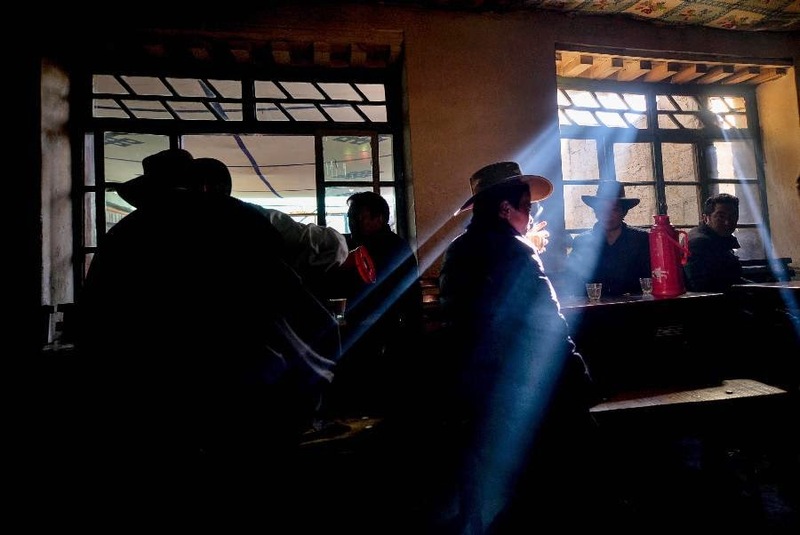 In Tibet, the situation is different than in the rest of China, as a 'separatism' factor is an extra headache for the CCDI's inspectors and Xi Jinping. Chen Quanguo's remarks should be seen in this context. The Party has two enemies instead of one: separatism is added to corruption. Here are Chen's remarks about 'separatism' and 'people on both sides'. On the one hand, one should insist and continue to fight corruption. On the other hand, one should struggle against separatism, build a clean government; combating corruption is an important guarantee for the success of the struggle against separatism. An important part of the struggle for a clean government is the performance of the party members and cadres in the struggle against separatism and anti-corruption. One should take seriously the struggle against separatism and worry about the outcome of the struggle against separatism; one should not believe in the 14th Dalai group’s fantasies (illusions), or follow the Dalai group; one should beware infiltration and sabotage activities in which are involved separatist party cadres. Indiscipline will be strictly and severely punished according to the law. Party members and cadres, especially leading cadres at all levels, involved in the maintenance of unity of the motherland, should carry out this important principle of struggle against separatism; they should always firmly take a clear stand; they should have a unified understanding; they can’t be ‘people on both sides’ [with the Dalai Lama and the Party]. Though Tibet was supposed to have been 'liberated' more than 60 years ago, this clearly shows that some Communist cadres are still on 'both sides' and worship the Dalai Lama. It will be easier for Xi Jinping and his colleague Wang Qishan, the boss of the CCDI to catch some tigers and some flies, than to change the inner faith of the Tibetans in their leader. 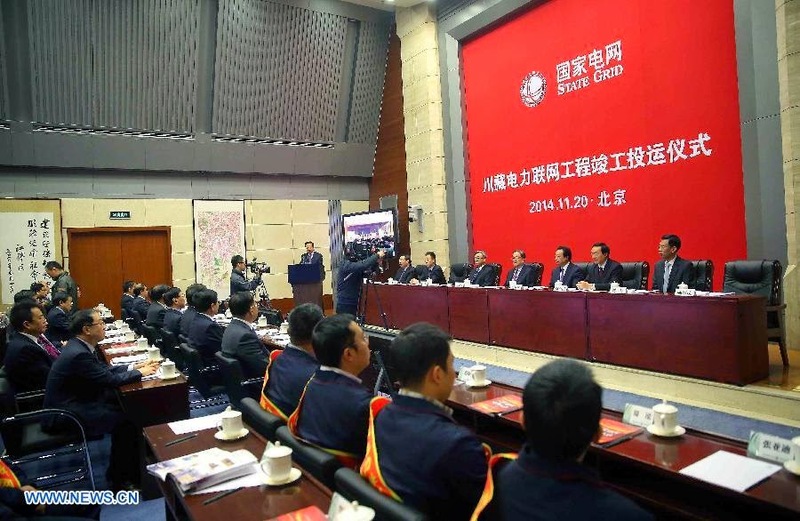 On November 4 in the afternoon, the Standing Committee of the regional party committee held a meeting to convey the spirit of the speeches of Xi Jinping and the report of the inspection team [of the Central Commission for Discipline Inspection or CCDI] which inspected the situation in Tibet and gave its feedback for rectification work. 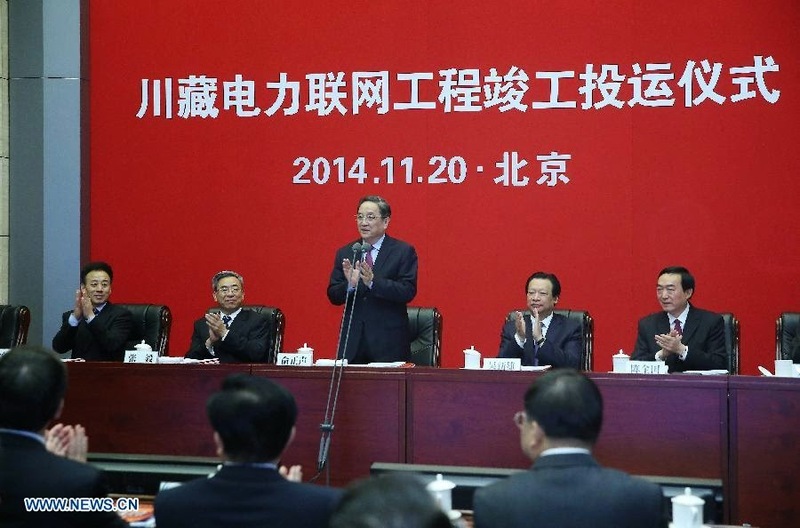 The Autonomous Region [TAR] Party Secretary Chen Quanguo presided over the meeting. The meeting noted General Secretary Xi Jinping’s important speech in which he insisted that the Party must manage the party’s affairs strictly with the correct attitude. One should follow the orders of Comrade Xi Jinping for building a clean government and combat corruption with a firm determination. The Inspection team has shown the direction to follow. We should conscientiously study and implement the important speech of General Secretary Xi Jinping and [CCDI] Secretary Wang Qishan and implement their important instructions and follow the requirements for an honest government. One should combat corruption while keeping in mind the entire process of development and stability work, in order to promote leapfrog development and lasting stability in Tibet. The meeting noted that the central inspection team noted the problems, made corrective recommendations, which are objective and comprehensive, which have a profound relevance. These recommendations are sharply to the point, in full compliance with the Central Committee’s spirit and in full compliance with the reality of the Tibetan situation. They are highly targeted, they provide proper guidance; they are educative and give us a wake-up call. The [TAR] Regional party fully agrees with the recommendations and strongly supports the central Inspection team’s opinions on Tibet. The Central Inspection team has asked us to earnestly implement corrective measures. It was decided to set up a Rectification Work Leading Group, headed by Comrade Chen Quanguo, Padma Choling, Lobsang Gyalsten, Deputy Secretaries Wu Yingjie and Comrade Deng Xiaogang as members. Under the strict supervision of CCDI, the Leading Group Rectification will have five special teams for anti-corruption work to supervise the rectification work group, check the ‘Four Winds’ issues and the rectification for the ‘funded projects’. To meet these requirements, it is necessary to implement the rectification work as an important task for the current and future times; this important agenda includes rapid deployment schedule and firm and realistic planning for doing a good job. Thematic studies should be undertaken to develop reform proposals, condemnation should be taken one by one, pulled out from the problem list; refined corrective measures should be done one by one, clear rectification responsibility should be fixed one by one, the problem will not be solved after withdraw [to Beijing] of the inspection teams. Feedback from the central inspection teams is needed to ensure full implementation of the rectification work, to improve the work style, and promote a clean government and continue the anti-corruption struggle. The meeting stressed that the primary task is to strengthen the political discipline, grasp the key rectification issues to ensure the rectification results; to further implement strict political discipline. Always put in the first place, strict adherence to political discipline; have a firm political stance, a clear political direction; this should be insisted upon in Tibet. Although Tibet is far away from Beijing, the heart [of the Centre] is always with the people of all nationalities. Xi Jinping as general secretary firmly believes that we are all closely linked together, at any time, under any circumstances through the same ideological and political action. Xi Jinping’s speech is highly consistent; one should listen to Comrade Xi Jinping’s command. Further one should strengthen the ‘Four Obedience’, and firmly correct indiscipline, liberalism and severely punish violations of political indiscipline; one should never allowed ourselves to engage in ‘gang’ groups, cliques, have a double face; one should have a fair and honest behaviour and resolutely safeguard the Party's centralized control and resolutely safeguard Xi Jinping's authority. 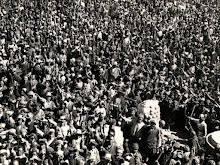 In mountainous Tibet, in the midst of difficult conditions, the main battlefield of the struggle is against separatism, but one should not think twice about a clean government and anti-corruption issues; there can’t be exception when one faces party discipline; one cannot cross the red line, break the bottom line. On the one hand, one should insist and continue to fight corruption. On the other hand, one should struggle against separatism, build a clean government, combating corruption is an important guarantee for the success of the struggle against separatism. One should strictly implement the provisions of the Central Committee’s spirit, expanding and constantly consolidating the results of the massline’s [campaign] educational practice; continue to carry out special campaigns to increase discipline supervision, public exposure and disciplinary accountability and seriously deal with disciplinary cases, in order to win the trust of the [masses]; it should become the new norm. One should think in strict accordance with the General Secretary [Xi] while serving the public; be diligent and pragmatic; clean and honest in the selection of good cadre and follow the appointment criteria and strictly implement the "Regulations on Appointing Cadres" and "Selecting and Appointing Cadres to Work on Strengthening the Supervision of Opinions"; concentrate on the "Four Focus", intensify one’s efforts to improve the way to achieve proper coverage of inspection work. Further implement one’s responsibility. If the Party committees do not have a firm grasp [on the cadres] and establish a clean government, it is a serious dereliction of consciousness. With the main responsibility firmly in mind, on its shoulders, in its hands, the Party Secretary [Chen] should earnestly fulfill his ‘first responsible’ role and the other members of the team too, should seriously implement their shared responsibility. Further strengthen the oversight responsibilities. Commission for Discipline Inspection at all levels should strengthen supervision and inspection efforts to effectively perform good discipline, fulfill its responsibility and strict implementation of a clean government while being accountable to fight corruption. They should further improve the institutional system; seriously implement the "establishment of a sound system for punishing and preventing corruption work plan 2013-2017"; fully implement the measures suggested by the discipline inspection, in line with the reality of Tibet institutional system for punishing and preventing corruption and explore the establishment of effective mechanisms to implement the motto ‘not rot, does not rot, do not want to rot’. Where has the Tibetaness gone?